The BAZER Primary Impact Crusher HS1000 is ideally suited to crush run of quarry, medium-hard, mildly to abrasive material down to a cubical, well graded product size of 0 - 150 mm (45% passing 25 mm) in a single pass. 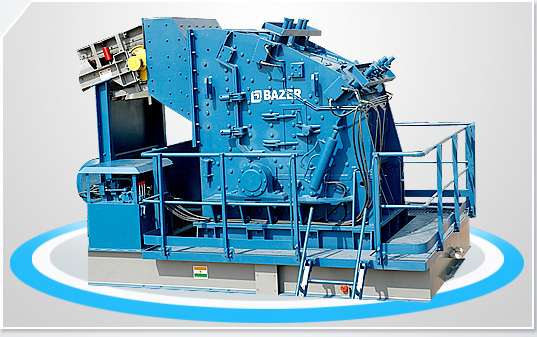 BAZER Horizontal Shaft Impact Crushers have a special feature of unique combination of heavy rotor; wear resistance blow bars & large crushing chamber. These are provided with large size openings having high tonnage for primary crushing. Designed for easy access with minimum down time they are suitable for stationary and as well mobile application. No. of Blow Bars 3 nos. The BAZER Primary Impact Crusher HS1300 is ideally suited to crush run of quarry, medium-hard, abrasive material down to a cubical, well graded product size of 0 - 50 mm (60% passing 25 mm) in a single pass. No. of Blow Bars 2 x 4 nos. Thick, interchangeable wear resistant liners that have been designed as a common shape. The liners have interchangeability level of approximately 80% which increase wear metal utilization. BHP is proud to introduce BAZER range of Horizontal Shaft Impactor, which is built with an exclusive combination of Features that provide value , performance and durability. These crushers with integrated hydraulics are ideally suited to crush hard, abrasive materials down to cubical having a high reduction ratio.